Born in Buenos Aires, Argentina, early on he became interested in music. Since then it's been an important part of her life. He has been a member of several rock bands ever since he was 16 years old. 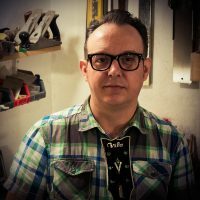 Living in Madrid, in 2006 started building instruments and in 2010 established as a full time guitar builder. With handcrafted devotion, the best technology and materials available and respect to tradition, he tries to build the finest instruments adapting it to the player, and not the other way around. Proposing a path to an unique instrument. The handcrafted nature of this instruments makes them very similar to the ones made in the "golden era" of electric instruments, when manual labour was the norm, but without sacrificing the modern techniques and technologies.